Tall flower arrangements add stature to an entryway, add color to an art nook or provide a focal point in a living room. 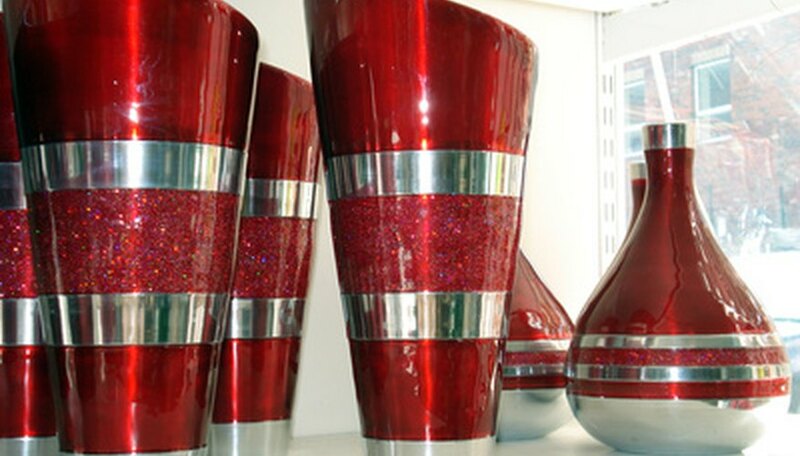 Vases come in many sizes from tiny to 3 feet tall or more. Most flowers don't have stems 36 inches long and will start to slide down into the vase. Before arranging flowers, cut off 1/2 inch to 1 inch of stem and plunge in ice water. Leave the flowers in the water for at least 60 minutes. The flowers will last longer and stay fresher with this treatment. Fill the tall vase 2/3 of the way with glass marbles or small fruits. This allows the shorter-stemmed flowers to rest on the marbles or fruit rather than having to reach the bottom of the vase. Crisscross the greenery in the vase with their stems resting on the top of the marbles. The crossed branches stabilize the flower stems and keep them in place. Slip the flower stems in between the greenery stems. Start with the taller flowers first, medium height next and then arrange the shorter flowers. Anchor the arrangement visually by placing a large flower, such as a peony or rose, on the edge of the top of the vase. Fill the bottom 2 inches or so of the tall vase with glass marbles to add weight. Place the smaller vase inside the tall vase. If you're concerned that it will be difficult to separate the two vases when you're through using them, put a paper towel between them in the back where it won't be seen. Fill the smaller vase with full-blown flowers like roses, peonies, carnations or chrysanthemums. The flowers in the center of the arrangement should be a bit taller than those toward the outside of the arrangement to give a mounded effect to the bouquet. Slip broad leaves around the base of the bouquet so it looks like a ruffle. Choose flowers that have long, sturdy stems. Larkspur grows to 4 feet high and flowers on long stalks nearly that long. Delphiniums, snapdragons and hollyhocks are long-stemmed as well. Sunflowers are another long-stemmed choice as are cosmos, zinnia and oriental lilies. Place flowering branches in the vase first and then the tall flowers. Finish the arrangement by resting the oriental lily stems on the branches and stems of the other flowers. Lily flowers are huge, up to 8 inches across when in full bloom. They should be toward the bottom of the arrangement. Change the water every day to keep it clear and the flowers fresh. Every third day snip off 2 inches from the stems. Tall vases can become top heavy when filled with flowers. Weigh them down by placing clear glass pebbles in the bottom.